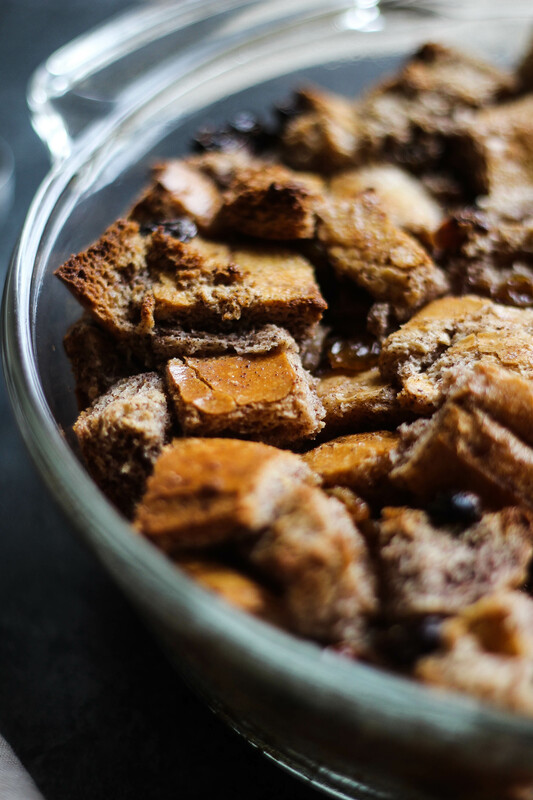 This Simple Bread Pudding recipe has been used at my family’s Thanksgiving celebration for as long as I can remember. Trust me, you’ll want to serve this one! Holy crap, people. I am so excited today because I am giving you an inside look into the food I’ve been eating my whole life. I say that because, this is a recipe my mom has been using for as long as I can remember. If you aren’t new around here, then you know that this is actually the second recipe I’ve shared from my moms collection (see: Mom’s Cuban Flan). She’s a great chef, I tell ya. 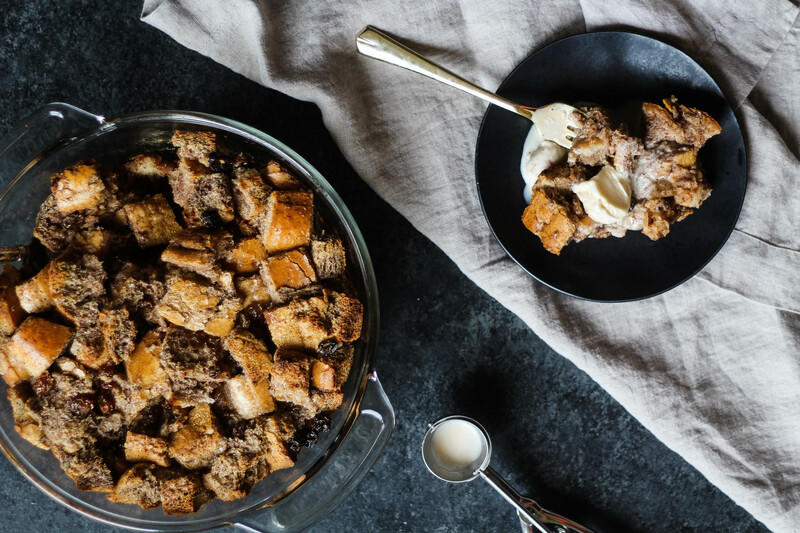 This bread pudding has been served at every Thanksgiving that I can remember in my life. And every year, we have zero leftovers. It’s THAT good! 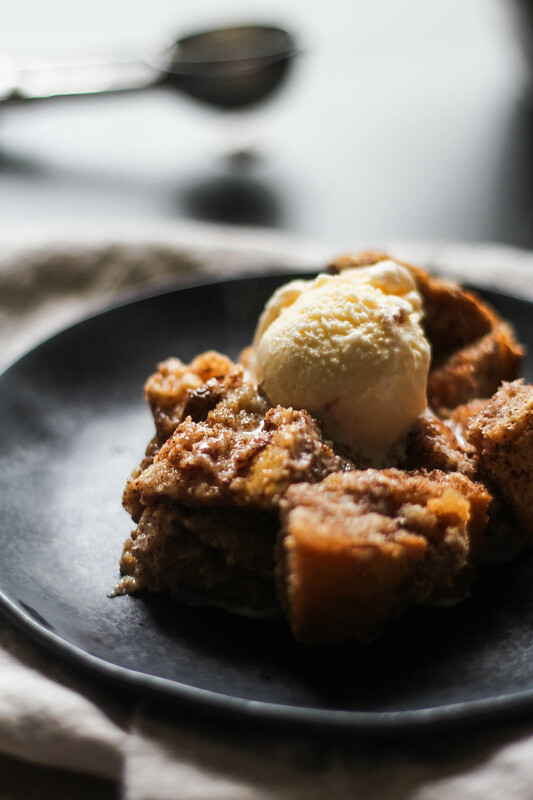 This bread pudding is ridiculously easy to make, but I will say it does contain a decent amount of sugar. 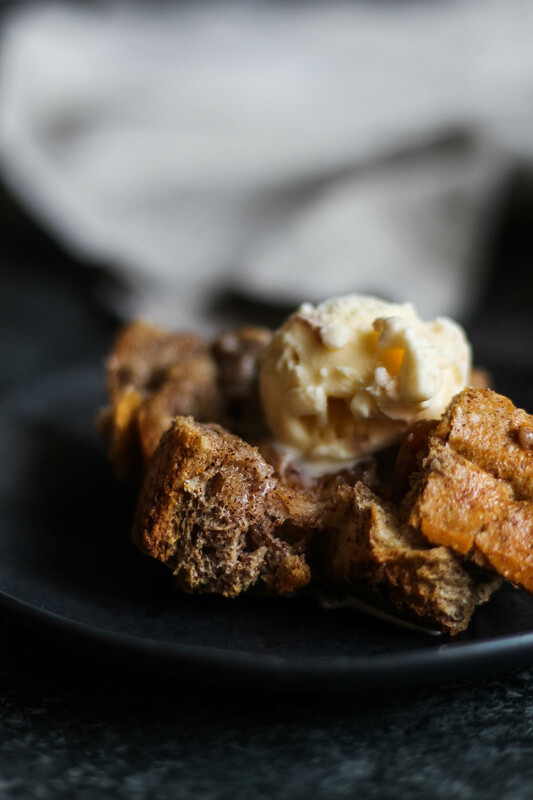 And believe it or not, the original recipe comes with even more sugar because it is paired with a delectable vanilla sauce that you pour over the bread pudding. I know, sugar *EEK*. But seriously, you don’t eat this everyday. I understand looking out for sugar intake; I’m all about it. However, I still make desserts like this, and I still enjoy desserts like this. I simply enjoy them in moderation. Everyone that knows me well, knows that I have a giant sweet tooth. As I’m typing this, I’m daydreaming about the slice of cake I enjoyed last night because a family friend made a giant pumpkin cake and brought us some to enjoy. Oh, and the night before was my brother-in-laws birthday, so yes, I enjoyed cake that night, too. So, let me speak to my method of dessert enjoyment, sans overeating. What I do, on Thanksgiving particularly, is I put a little bit of each dessert on my plate. This way, I can enjoy each dessert without overeating. I stop when I’m satisfied, and I stay busy doing something else. I don’t hover over the dessert table; I talk to family and have fun. If you are trying to avoid added sugar, I get it! 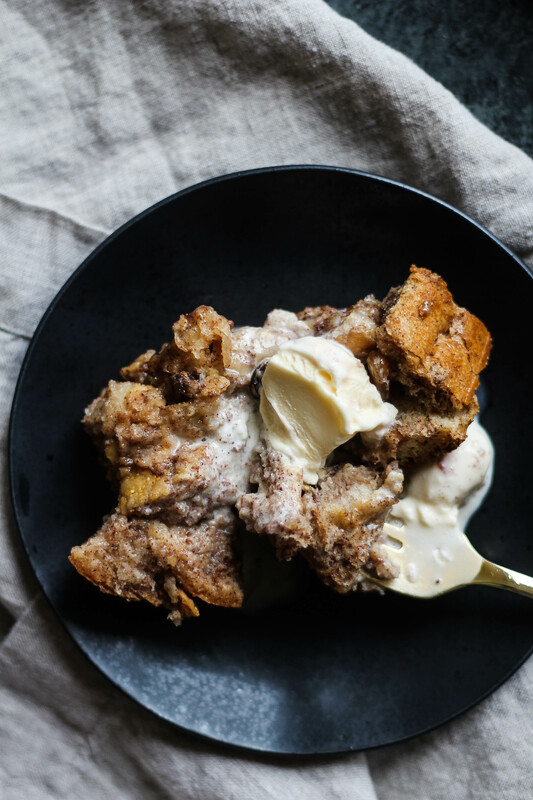 That’s why I left out the vanilla sauce – sometimes I prefer to simply top the bread pudding off with a scoop of cold, vanilla ice cream. But if you’re looking for a hot, smooth vanilla sauce to top the bread pudding with, I will provide the recipe below. Here’s how ya make the vanilla sauce. Combine the first seven ingredients in a saucepan over medium heat. Whisk constantly, about 10-12 minutes, or until thickened. Remove from the heat; stir in vanilla. Serve warm or at room temperature. This yields about 1 ¾ cups. Combine first four ingredients in a large bowl. Stir in coconut oil and half and half. Gently stir in bread and raisins. Pour into a lightly greased 9x9 inch baking dish. Bake for 50-55 minutes. At the thirty minute mark, remove and cover with foil. Place back in the oven for remaining time. How do you avoid overeating on Thanksgiving? Haha, I was just wondering this morning what to do with the half loaf of bread I have sitting on the counter that’s going stale. Unfortunately, it’s brown sandwich bread, so it’s not quite right for this recipe, but you’ve given me an idea for what to do with the bread (and I’ll definitely try this recipe as-written soon!). Thanks! Oh YUM! This bread pudding looks awesome! I use the same dessert-eating method you do on Thanksgiving too….a little bit of everything! 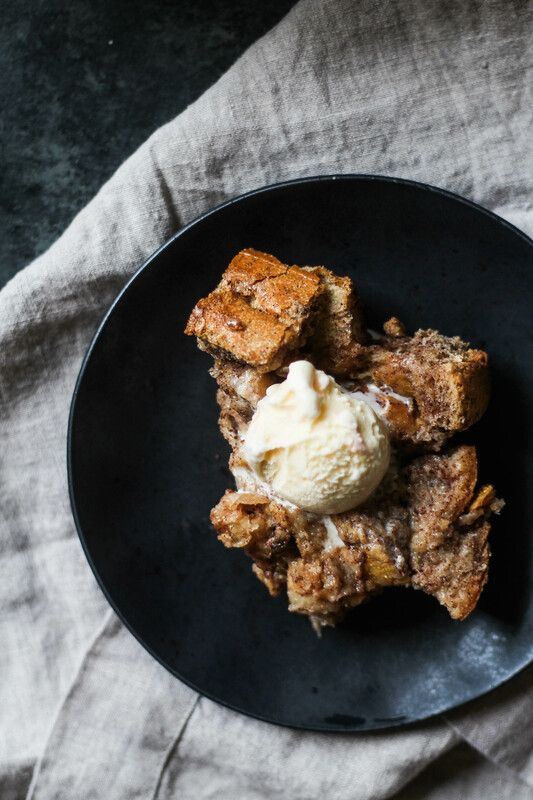 😉 I’ve had a bourbon bread pudding before and it was INSANELY good. This looks SO good and has me pumped for all of the Thanksgiving treats we’ll soon be eating. I’m always a fan of pumpkin pie (or really pumpkin anything), but this might need to be introduced to the family as well. 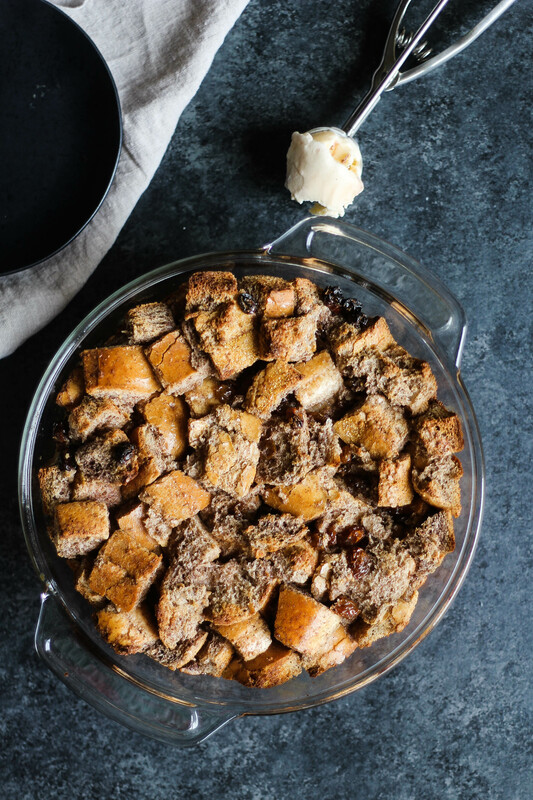 I’ve never made bread pudding before, but this looks divine! And so simple! This looks absolutely delightful Christina; and I definitely like to eat sugar in moderation. It’s interesting, because when I tried sugar cane for the first time it is definitely way sweeter than regular sugar. I’m really hoping I can make this… WE have LOTS of bread. have an extra seat for Thanksgiving?!?!?! jk! This looks soooooooo gooooood!